Owning hundreds of dazzling pairs of shoes is nearly every girl’s fancy. If it were left up to us we would keep giving into our shoe fetishes. But regrettably, that’s not always probable, owing to budget and closet space constraints (unless you live by Sonam Kapoor or Carrie Bradshaw’s standards of course). Don’t be disheartened though; here is a list of all the staple flats you will need to turn any outfit into an eye-catcher. 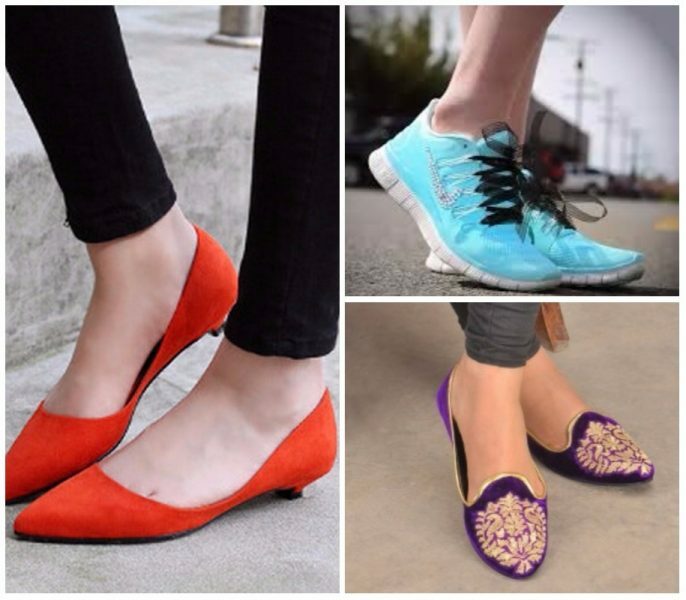 Be it an Indian outfit or a contemporary one, these are five kinds of shoes will make your wardrobe planning a cake walk. Your shoe closet must have a perennially reserved position for ballet flats. And why not? They are equal parts of chic and comfort. These super cute flats are your go-to shoes as they complement any outfit you pick. Play with colors, prints, and textures to give your outfit bonus points for style. Wear a pair of metallic ballet flats with denims and a basic T-shirt with your hair in a loose bun and you are good to go. You can also wear ballet flats with small pom-poms with a simple kurta and tights to give your look an elegant finish. Want to take a break from the girly look? Go for a pair of sneakers. They are laid-back and perfect for any occasion. There is a massive assortment of sneakers, from casual kicks to canvas sneakers they all look extremely sporty. Throw on your much loved LBD and a pair of sneakers to turn heads everywhere you go. You can also wear them with long kurtas and denims to give your outfit the perfect Indo-western feel. An Indian girl’s favorite, Kolhapuris originate from Maharashtra. But have found their way into the hearts and feet of girls all over the country. Go for the basic ethnic kolhapuris for an artsy boho vibe. And if you want the more sophisticated and neat look go in for the modernized version of them with small wedge heels. Obtainable in an immense range of colors, they are sure to brighten up your shoe wardrobe. You can wear Kolhapuris the conventional way with any Indian outfit. You can also wear them with a denim and a T-shirt for an unconventionally striking look. Mojaris and jootis are an absolute must-have in every Indian girl’s wardrobe. The USP of this shoe lies in its intricate embroidery and ethnic prints. Available in various bright colours, these shoes will illuminate your whole look. An ultimate match for Indian outfits, they can also pull western attires together. These versatile pairs of shoes look stunning and are extremely easy to wear. No matter how many designer shoes you own, without a pair of flip flops your wardrobe is incomplete. Flip-flops are a vital need, be it summer or monsoon you can always count on them. They are comfortable and unfussy and give the perfect laid-back chic look. 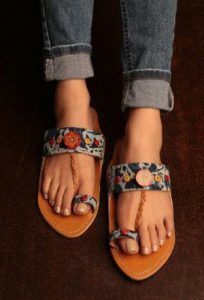 These reliable sandals can be worn with just about anything from jeans and tights to even churidars. Pick them up in various colors and designs and even embellished with dainty stones and you never have to worry about daily footwear again.